I have a confession to make: sometimes it's hard to be kind. Sometimes it's much easier to be mean, snarky, snooty and maybe even a little nasty. But I remind myself that my parents taught me better and try to be and do better. What on Earth does this have to do with a food blog, you may think? Well, earlier this month I received a lovely package in the mail from KIND Snacks filled with several varieties of their bars and two varieties of their healthy grains. Although I've had KIND bars before (I love the ones with dark chocolate! ), I've never tried KIND healthy grains. I decided to do something fun, sweet and easy with the Oats & Honey Clusters with Toasted Coconut, one of the healthy grains I received. 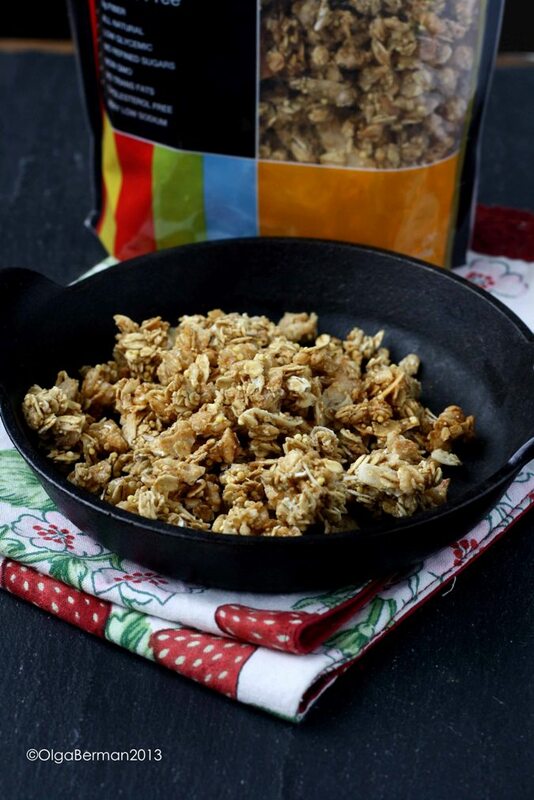 Oats & Honey Clusters with Toasted Coconut combine full flakes of toasted coconut, a touch of honey and whole grains amaranth, quinoa, oats, millet, and buckwheat for a naturally sweet snack. These hand-crafted clusters are a good source of fiber and provide 17g of whole grains per serving. 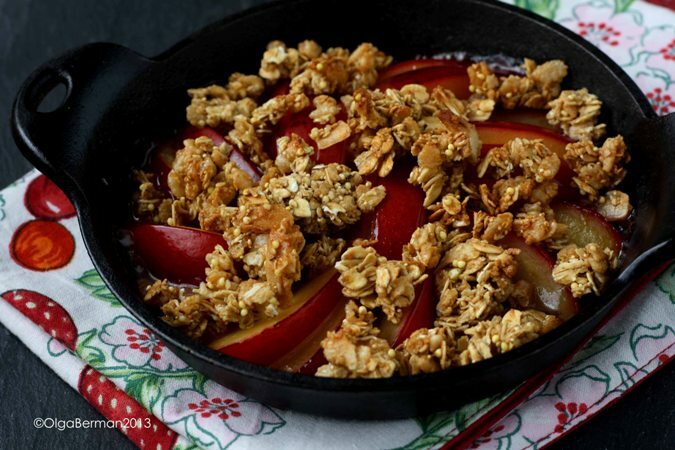 This Easy Plum Dessert with KIND Healthy Grains can be served as a dessert, as the name implies, or as a weekend breakfast!! 2. In a 6" cast iron skillet, melt the butter on medium heat. 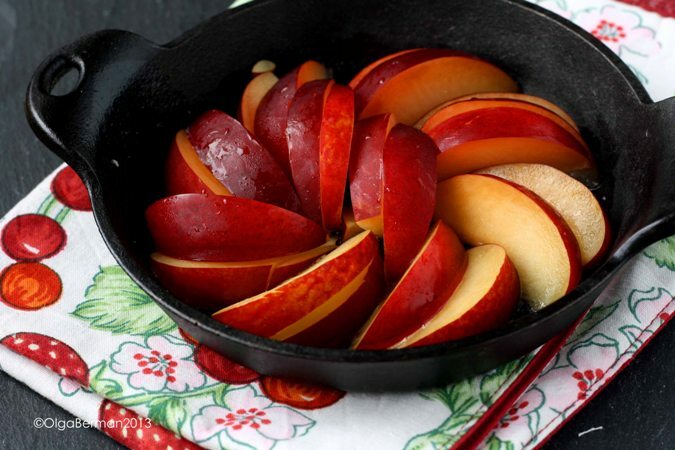 Arrange the plums in a skillet and bake in the oven for 5 minutes. 3. 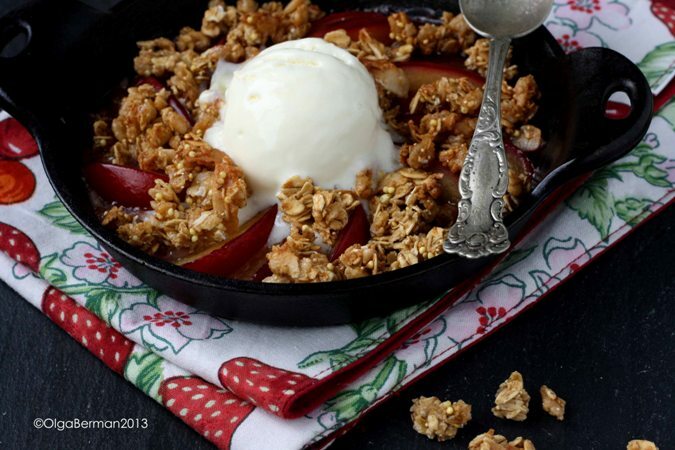 Remove the skillet with the plums from the oven, top with the Oats & Honey Clusters with Toasted Coconut and put back into the oven for 5 minutes. 4. 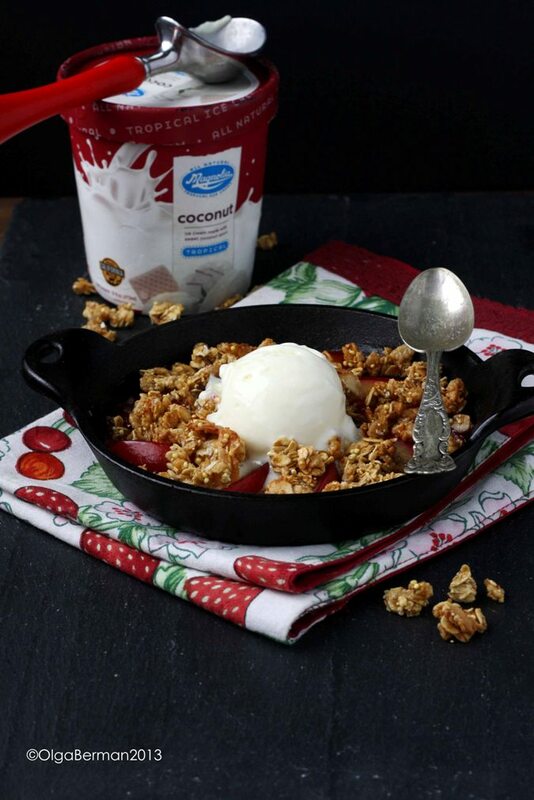 Remove the cast iron skillet from the oven, top with a scoop of coconut ice cream and eat immediately! Dessert in under 15 minutes!? Yes, please! This was such an easy and successful dish. The healthy grains stayed crunchy, and I loved how the coconut flavor in the healthy grains was intensified by the coconut ice cream. If you've tried KIND Snacks, what's your favorite flavor? Disclaimer: I received several KIND Snacks products free of charge, but was not paid for this post. All opinions are my own. 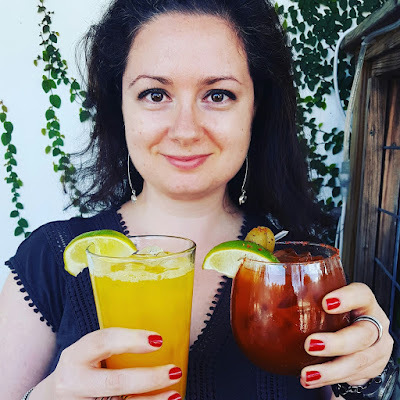 July is almost over, which means one thing: it's time for another Russian Recipes Revisited post! When I was growing up in Moscow, weekend breakfasts were always a big thing. They usually were savory, one pot/pan meals that could be shared by the entire family. 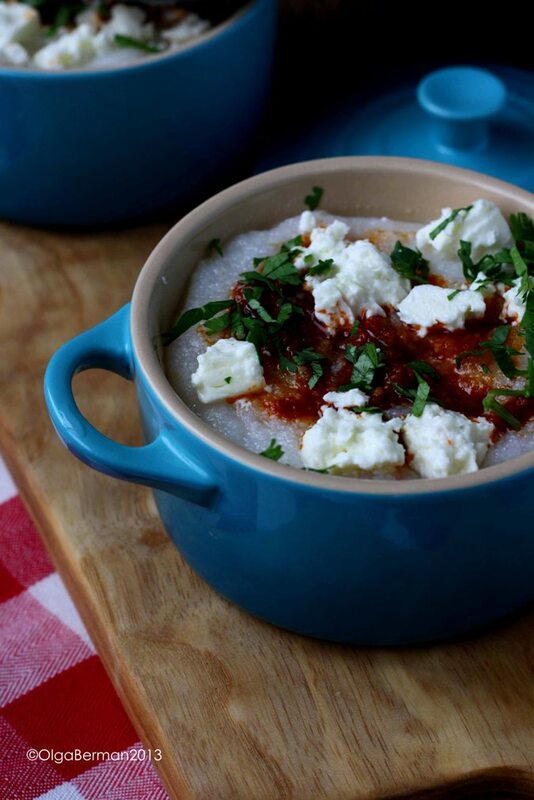 One of the simplest of those breakfasts was polenta with feta that my mom made often. 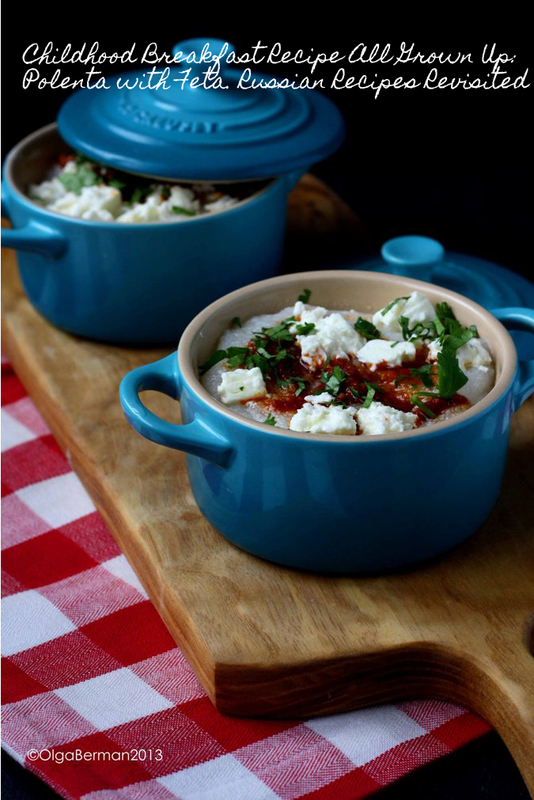 Yes, that's it: just a big pot of golden polenta divided into bowls and topped with chunks of feta. 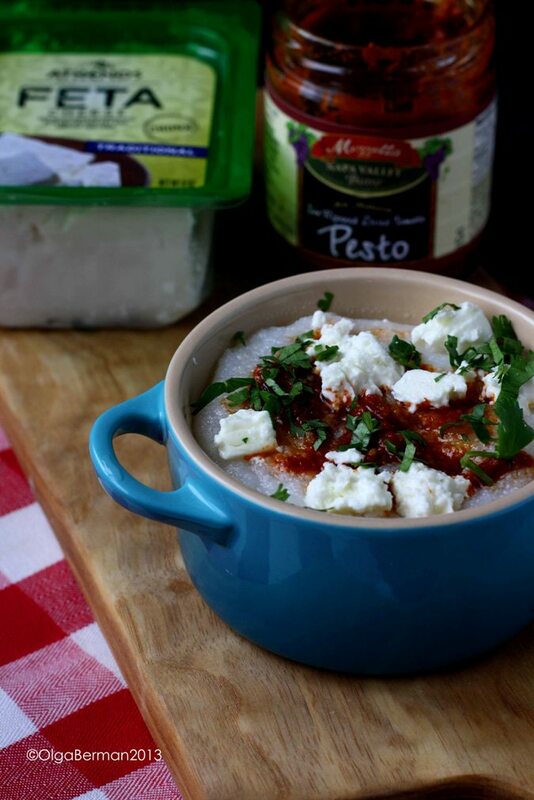 The feta would slightly melt and add the great salty flavor to the polenta. 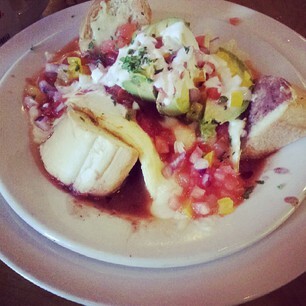 It was a filling and uncomplicated dish. I've been thinking about blogging this "recipe" for a while but one thing stopped me: it would not photograph well. I'm SUCH a food blogger ;) So I decided to slightly change up my childhood favorite and make a grown up version, which would not only have stronger flavors, but also be more photogenic. 1. Ladle the cooked hot polenta into a bowl. Top with feta, pesto and cilantro. What are some of your favorite childhood breakfast dishes that you've altered to make grown up? When visiting friends or family, I always like to cook at least one meal for them. It shows love and care and takes the pressure off eating out all the time. 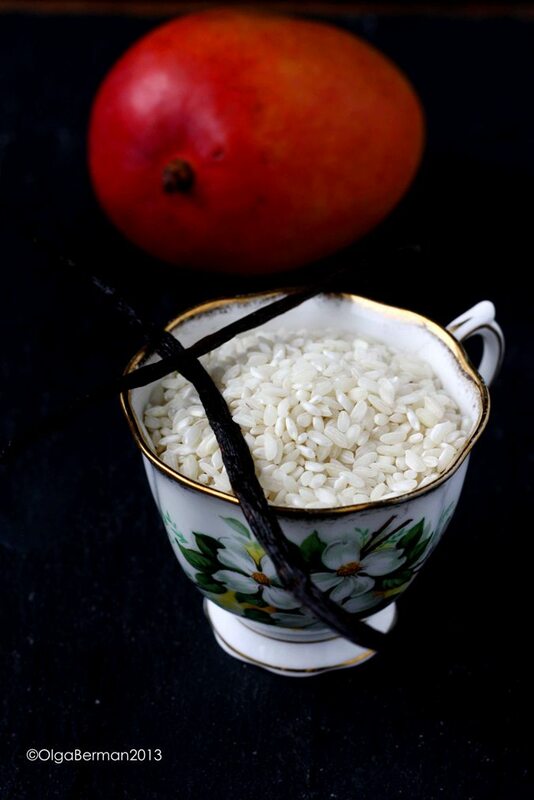 When I visited my friends Jenn and Luis in Richmond for 4th of July weekend, some of the things I packed with me were a vanilla bean, a pretty metal bowl, and carnaroli rice because I was planning on making a version of Robyn Webb's COCONUT CARNAROLI RICE PUDDING. That was one of my favorite recipes I made and photographed during the two years of freelancing for Robyn, and I was sure Jenn would like it as well. 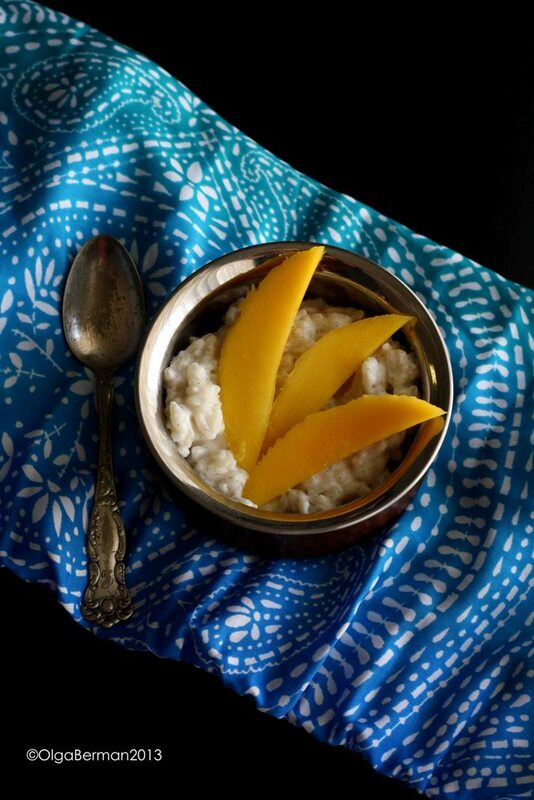 But of course I made a few changes to make that recipe my own: Mango Rice Pudding Recipe: Comfort Food at Home. 1. 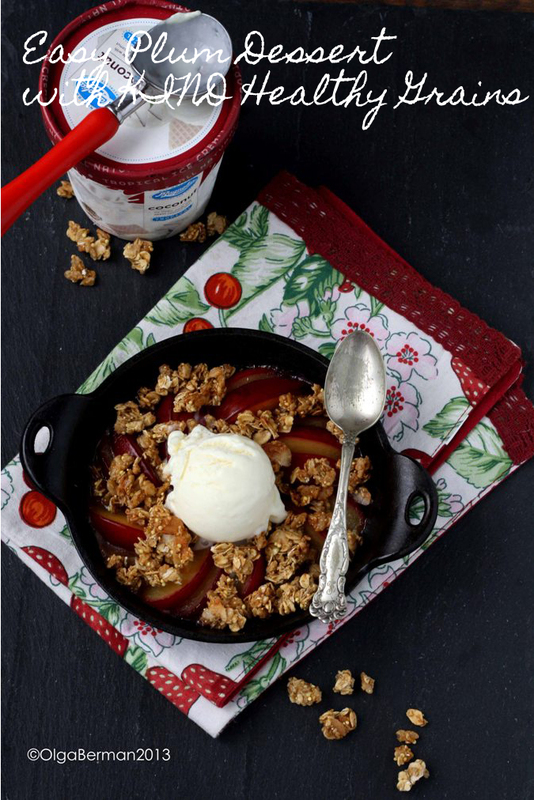 In a heavy bottomed pan combine rice, two types of milk, sugar and vanilla bean. Bring to a gentle boil, then lower the heat and continue to cook for 30 to 40 minutes, making sure to stir the rice every 10 minutes. 2. 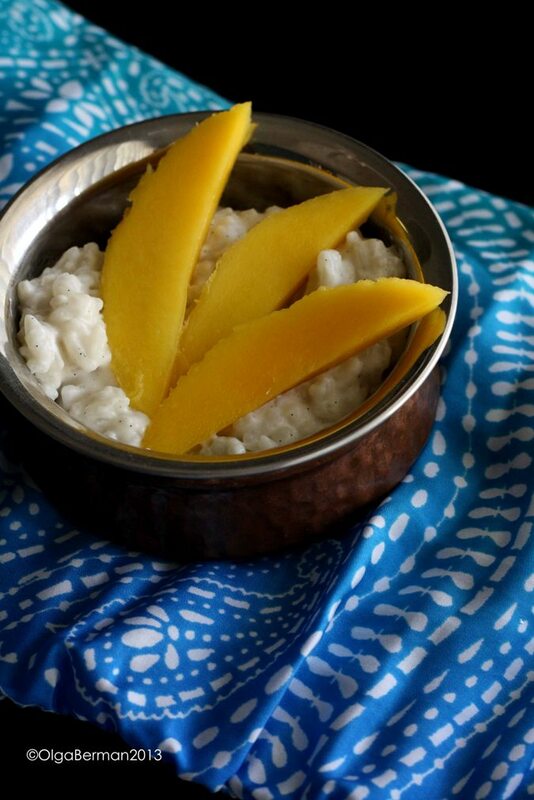 Once the rice is cooked through, remove the vanilla bean and serve topped with mango slices. This is such a great and easy dessert. 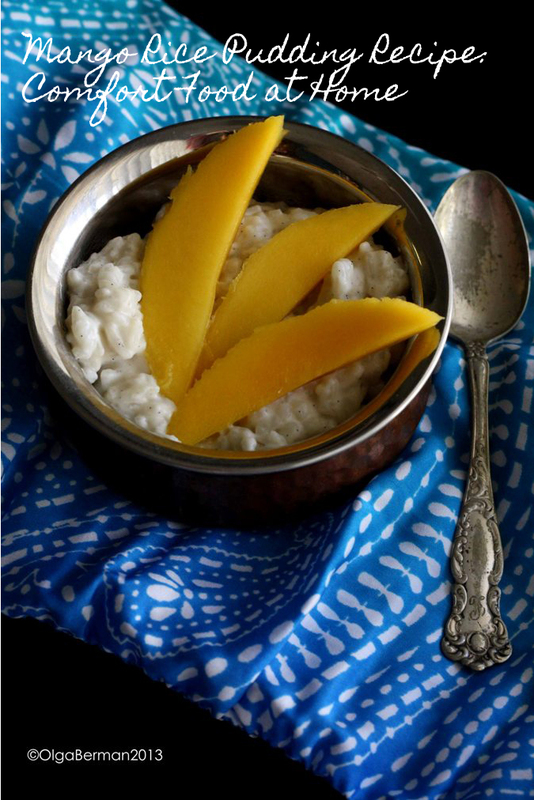 I love the specks of vanilla bean in the rice pudding and the contrast of sticky hot rice with cold mango. 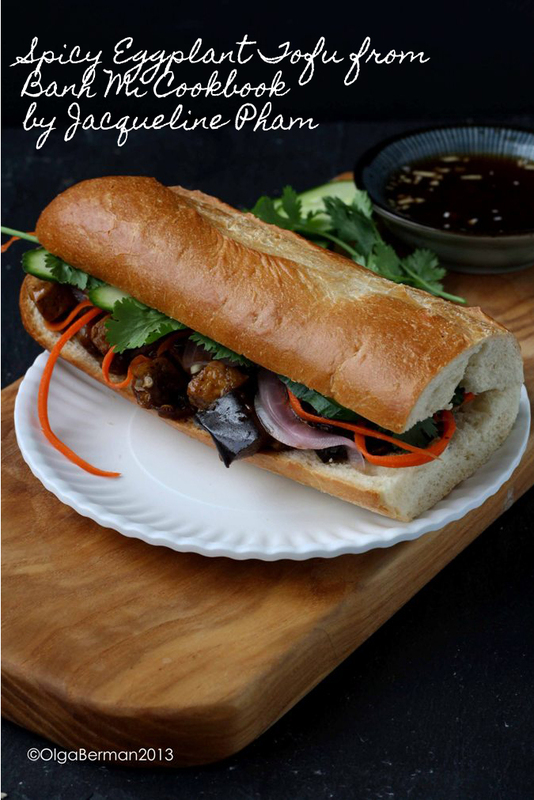 Earlier this month I received a preview copy of Jacquelin Pham's Banh Mi cookbook. The book has a lot to offer: everything from breakfast to dessert and seafood, meat and vegetarian selections. 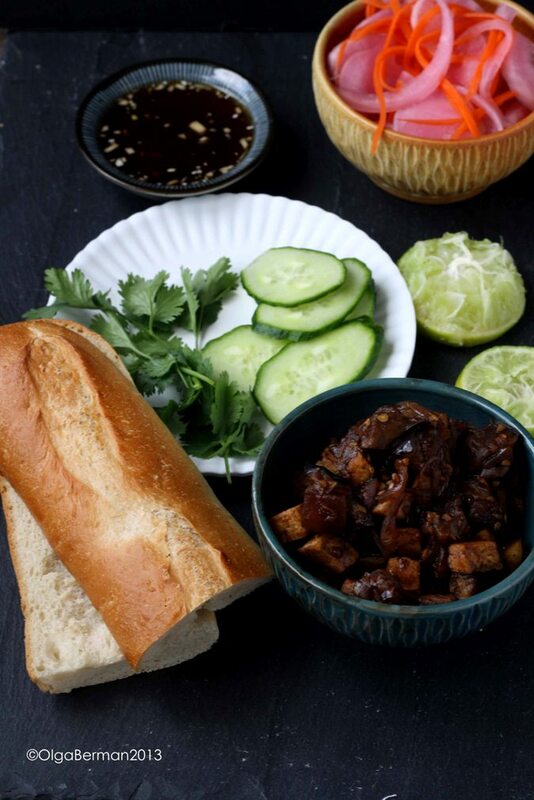 There is even a glossary of Vietnamese cooking terms. 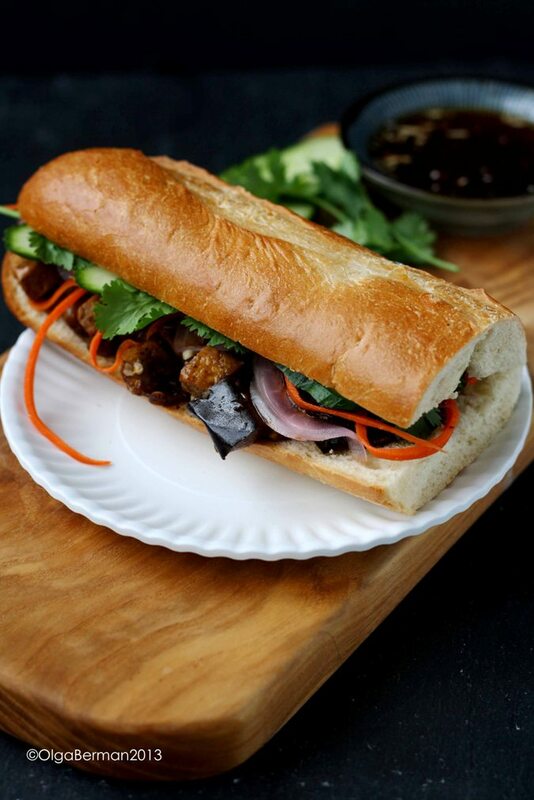 Although I love Vietnamese food, I've never attempted to cook it. This was my first attempt, and it worked out great. 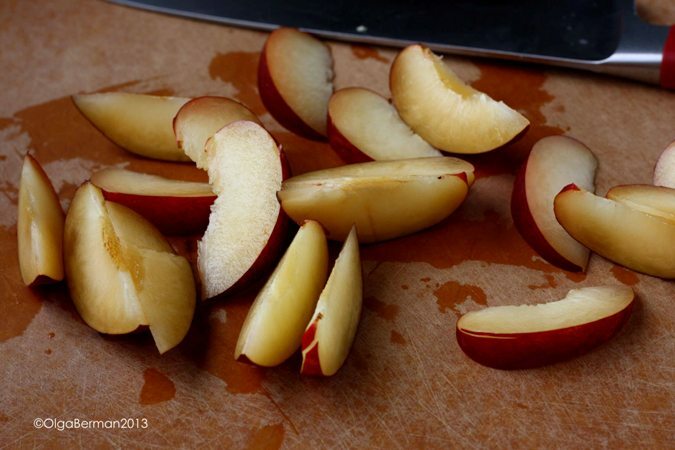 I decided to take quite a few shortcuts instead of following Jacqueline's recipe because I was short on time and patience and most of the recipes in the book do require you to have time and follow through. Regardless of the shortcuts I took, I loved how the Spicy Eggplant Tofu turned out. 1. Heat a bit of oil in a wok, add tofu and saute until the tofu turns golden. Remove from the wok. 2. Add a bit more oil in the wok. Add diced eggplant, ginger and shallots and saute for 5-8 minutes. 3. Meanwhile, mix together 1 tablespoon black bean paste, 1/4 cup soy sauce, 1 tablespoon sugar, salt and pepper, and red pepper flakes. 4. Add the tofu back into the wok, pour the black bean, soy and sugar sauce and toss well. 5. Cover the wok and let the mixture cook for 5-8 more minutes. Then drizzle with sesame oil. 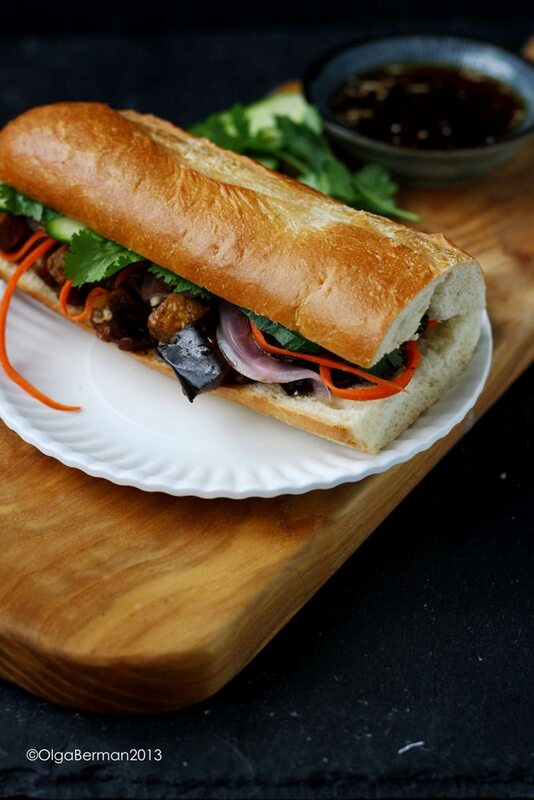 To serve, add the eggplant/tofu mixture to a baguette, top with pickled vegetables and fresh cilantro and drizzle with some of the vegetable dipping sauce. I loved the flavors in this sandwich. 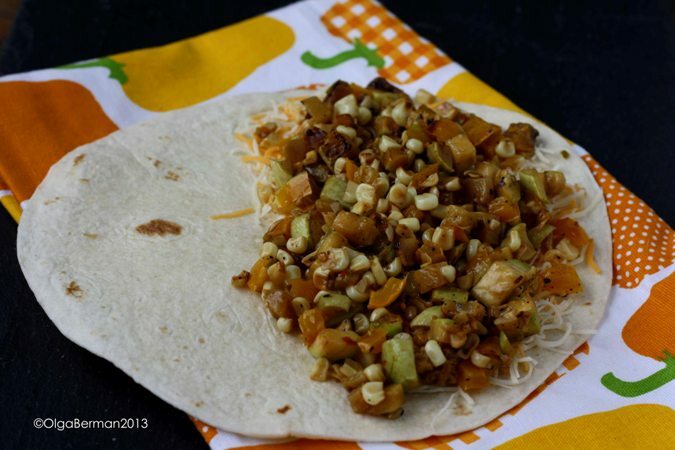 It's a great option for vegetarians or for meat lovers who are trying to eat a bit better. If you are a family of 1 or 2, you will have some of the eggplant/tofu mixture left: use it on top of rice the next day. 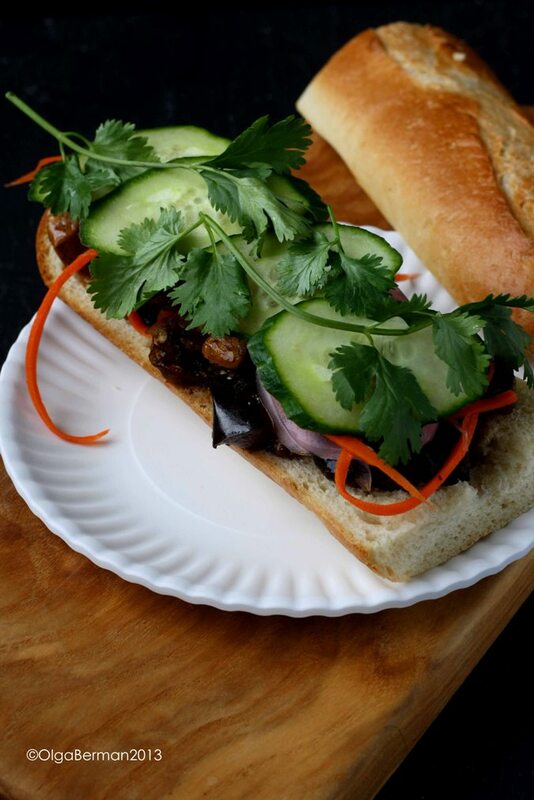 Have you made a banh mi before? What was your experience? I love potato salads, don't you? I usually make my potato salad with mayonnaise, but this time I decided to make a mayonnaise free potato salad: variety is good, yes? 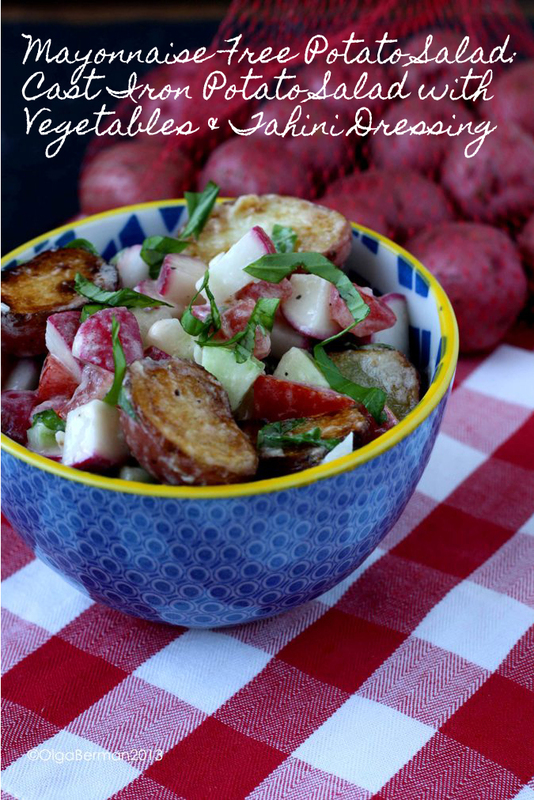 In the Summer I love using small red potatoes in my salads because they cook quickly and don't need to be peeled. 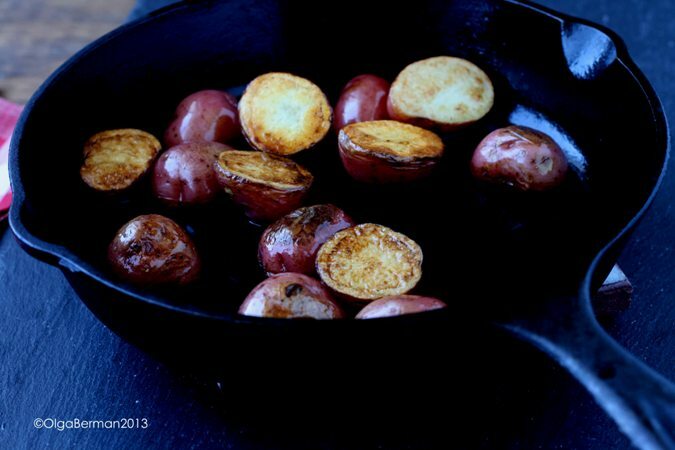 For something different, I decided to crisp up the potatoes in an iron skillet after partially cooking them. This not only gave a great color to the potatoes, but also helped them to retain their shape and texture and not get soggy in the dressing. 1. Heat a bit of olive oil in a hot cast iron skillet. 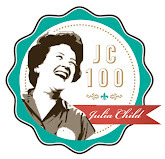 Add parboiled potatoes and cook until potatoes form a golden crust. 2. 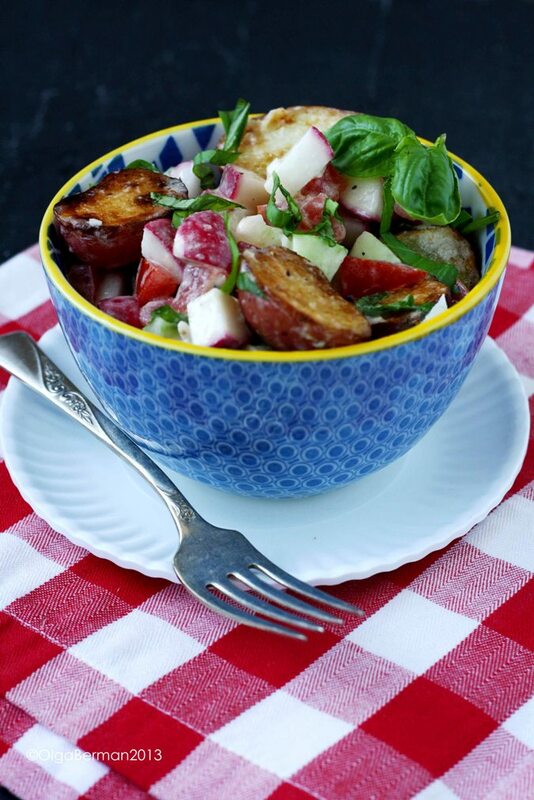 Combine slightly cooled potatoes with the rest of the salad ingredients. 3. 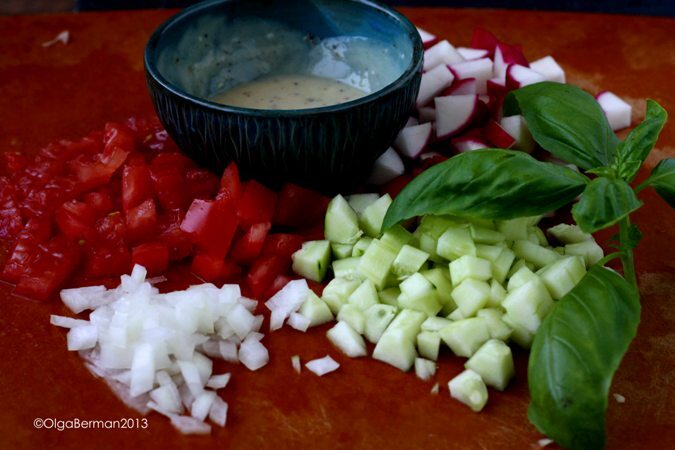 In a small bowl whisk together dressing ingredients and lightly dress the salad. You don't need to use the entire amount of the dressing. I loved this colorful salad with plenty of texture and flavor. This was a great way to get your vegetables in! 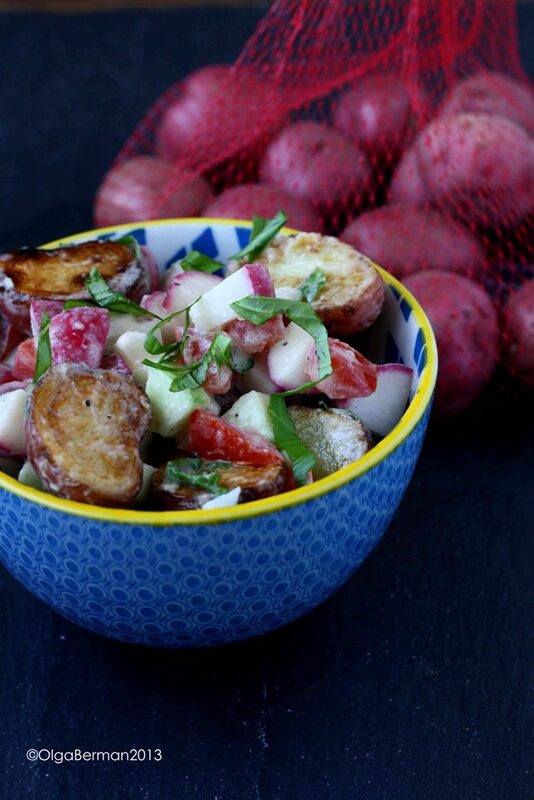 What's your favorite way to make a potato salad? 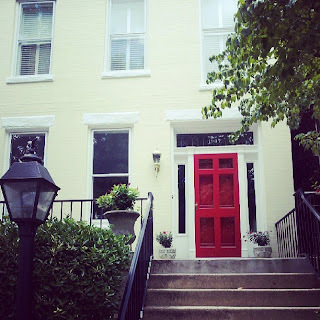 Is it as sweltering hot where you live as it is in DC? It feels like it's 100 degrees here! I cannot wait till the fall cool air comes...but I'll be waiting for a while. In the meantime, I'm cooking lighter meals that don't require a lot of time or heat or baking. 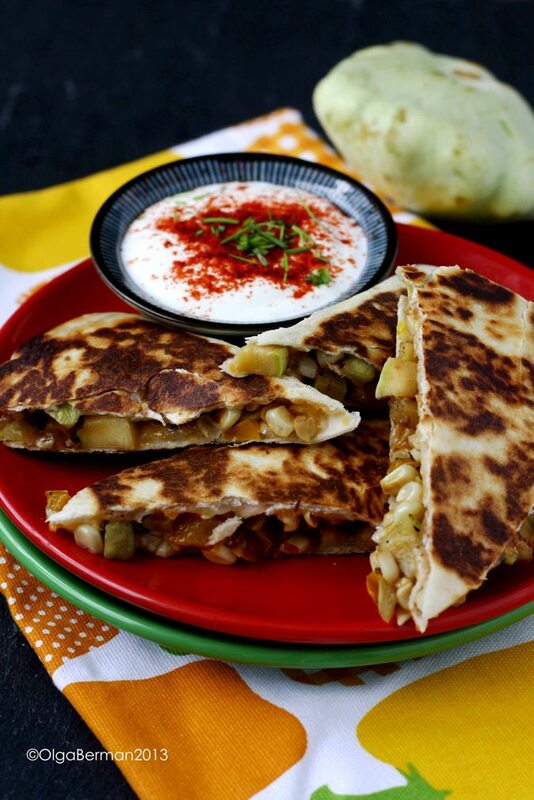 This Patty Pan Squash Quesadillas recipe is one of my favorites. It all started when I made Patty Pan Squash Succotash with a Poached Egg. I had half the succotash mixture left over and decided to make a quesadilla with it. But I'll retype the full recipe for you :) Do you feel the ♥? 1. 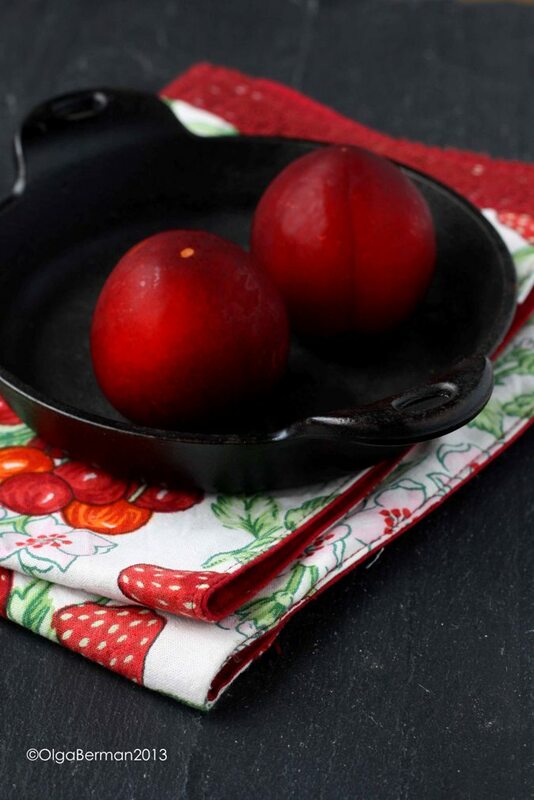 Heat the olive oil in a skillet. Add the next four ingredients and saute seasoned with salt & pepper and red pepper flakes until golden brown. 2. 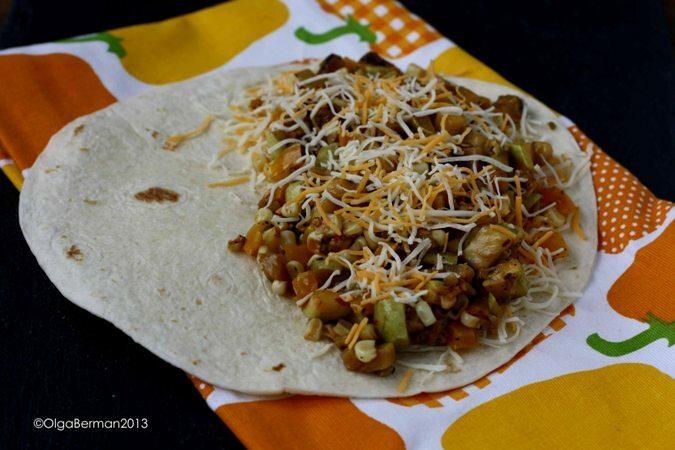 Add a bit of cheese to your tortillas topping with half of the succotash mixture and more cheese. 3. 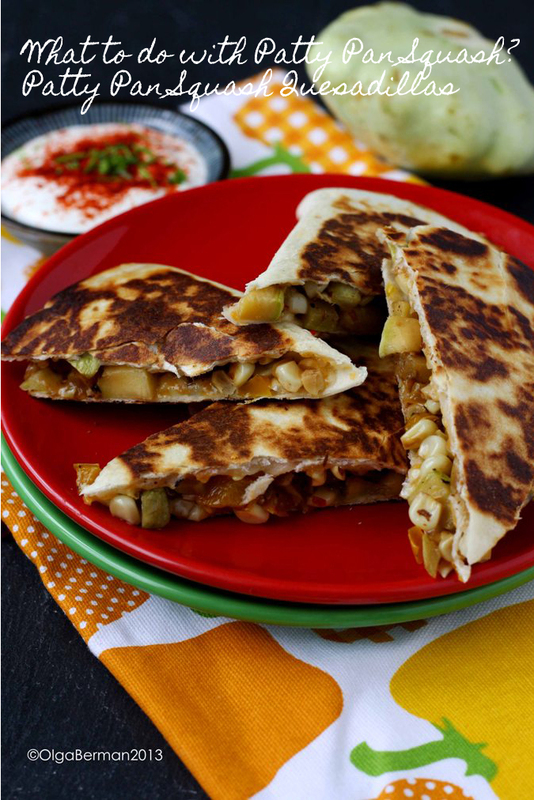 Fold each tortilla in half and saute in a bit of olive oil 2-4 minutes on each side until golden brown. 4. 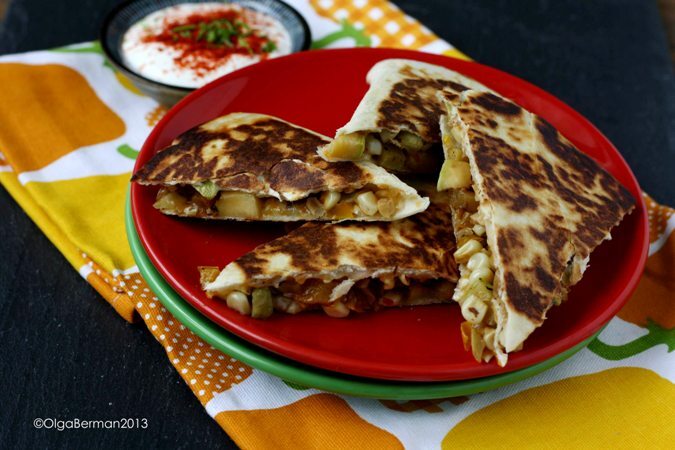 Cut your quesadillas into triangles and serve with sour cream, smoked paprika and fresh herbs. 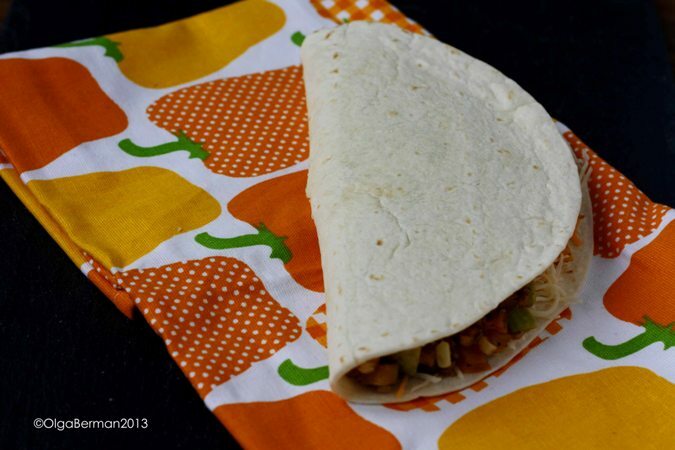 I really liked this: not heavy, but filling and so many vegetables!!! 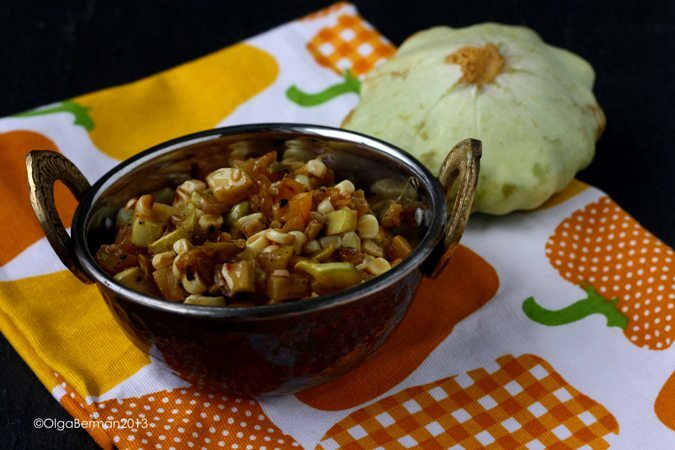 You can use regular zucchini if you can't find patty pan squash and play around with different spices. 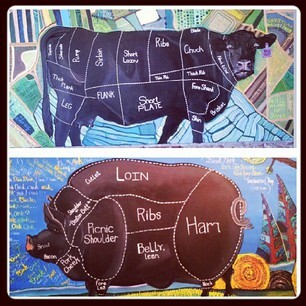 What are you cooking these hot summer days? The smell of charred eggplant makes me think of my grandparents. They would always cook a whole eggplant directly on the flame of the gas stove and then mix the flesh of the eggplant with marinated (at home!) tomatoes, chopped white onion and sunflower oil. Sometime last week I did something similar with my own spin on it and decided to take a few photos not just with my phone, but also with my DSLR. Please make this recipe! You will love it. 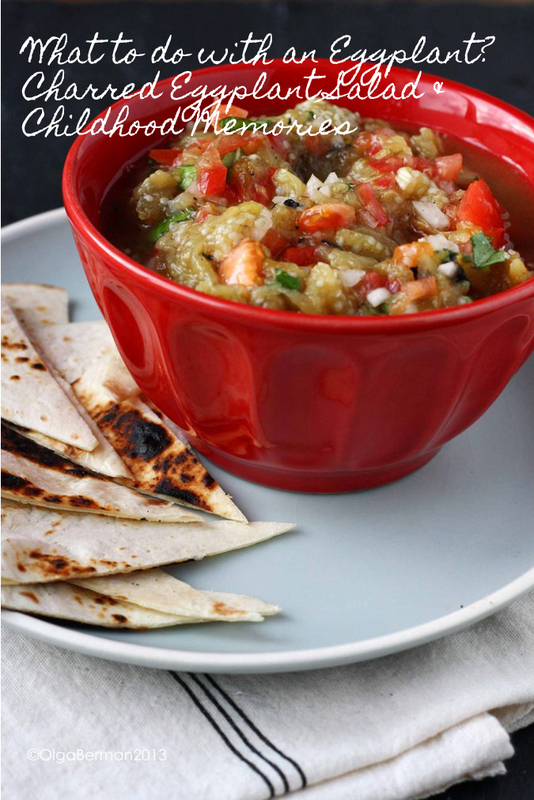 I ate it for dinner, but it can also be a quick side dish or a dip. 1. Place the eggplant directly on the flame of your gas stove. Rotate every few minutes with tongues until all of the eggplant skin is completely black. 2. Place the eggplant in a bowl and cover with plastic wrap and allow to cool. 3. Once the eggplant has cooled, slice it in half and remove the flesh. 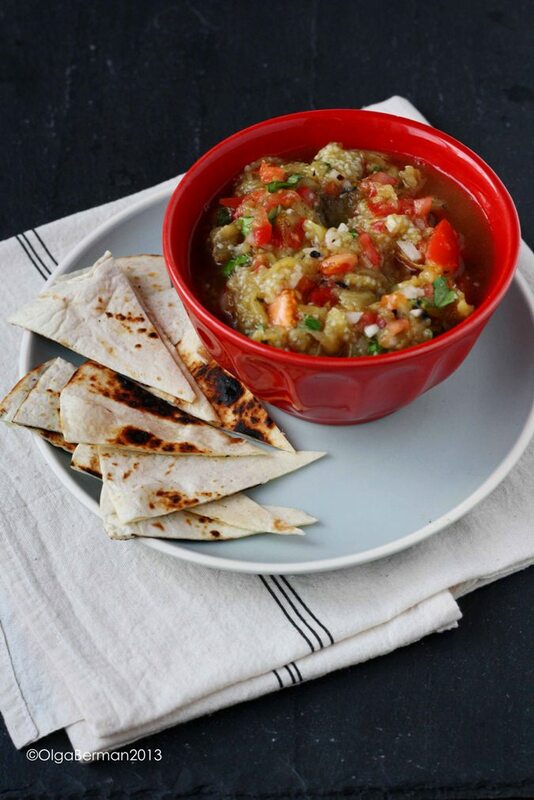 Mash the flesh of the eggplant in a bowl. 4. Add the rest of the ingredients and refrigerate for at least an hour. 5. Serve with bread or pita chips. 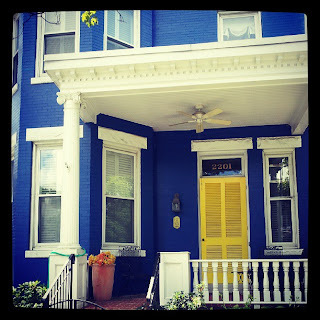 If you haven't won my first giveaway for a copy of Amy Riolo's Nile Style cookbook with six of my photographs in it, do not fret. 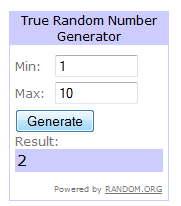 This is your second chance! 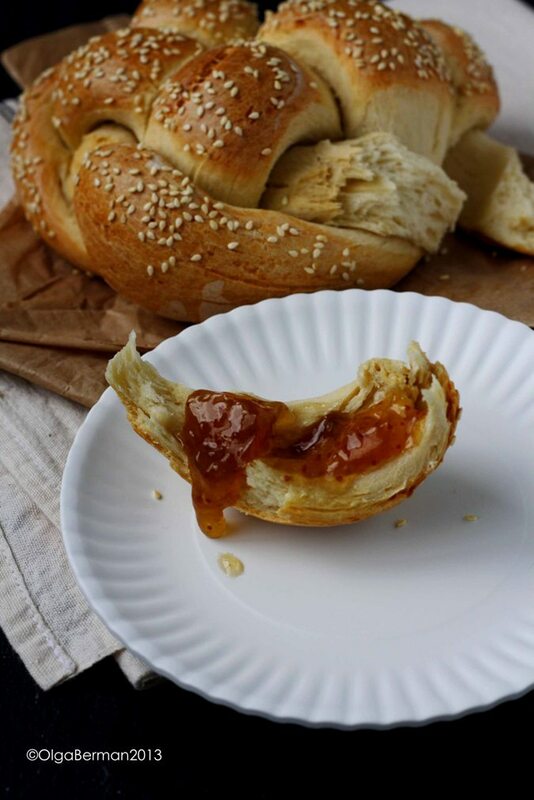 Leave a comment telling me your favorite bread for a chance to win your copy of the book. 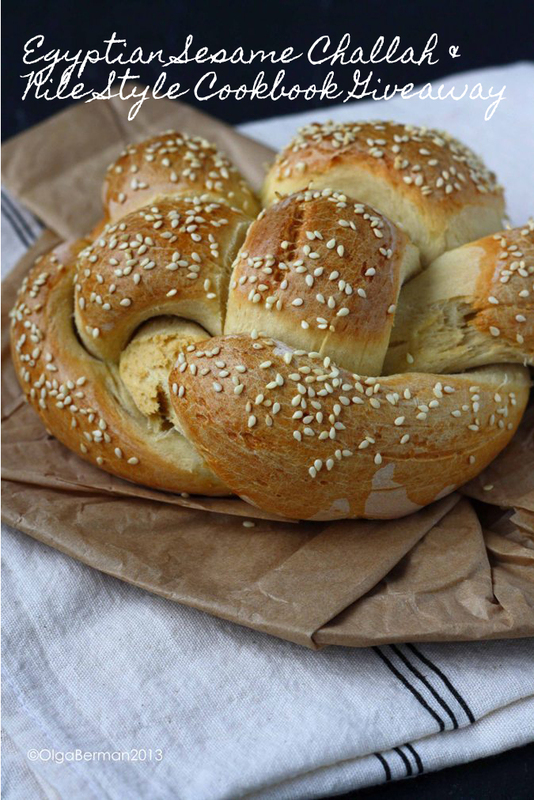 My favorite photograph I took for Amy's book was definitely Egyptian Sesame Challah, so that's the recipe I will share with you today. I made half the recipe and had to use both the regular and bread flour and it still came out awesome! This is definitely a keeper. Combine yeast with 1 cup lukewarm water in a small bowl, stir to combine and allow to rest until frothy. In a large bowl, combine sugar, flour, salt, 2 eggs, and yeast mixture. Stir well to combine and form a dough. Turn mixture out onto a lightly floured work surface. 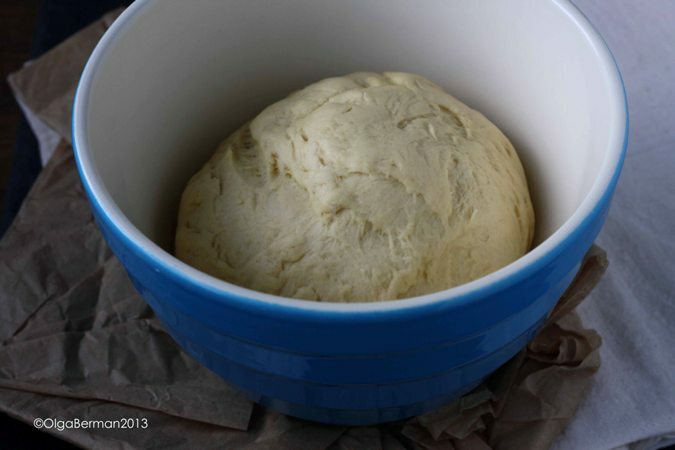 Knead dough for 10 minutes, or until smooth and elastic. If dough becomes too sticky to work with, add a little more flour, 1/4 cup at a time, and continue kneading. 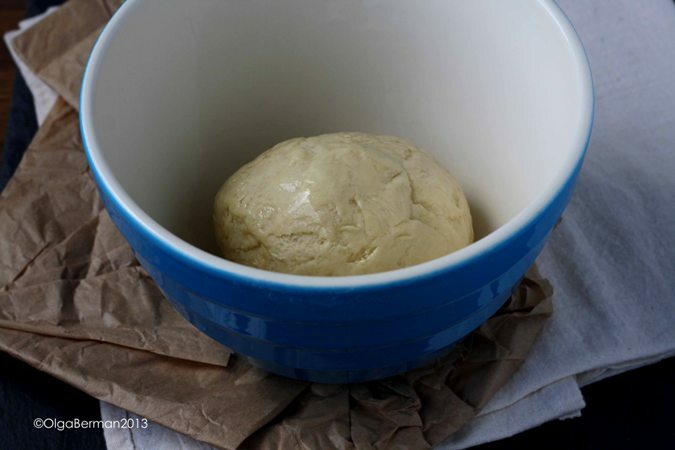 Place dough in a large bowl greased with butter or oil. Turn to coat, cover with a clean kitchen towel, and allow to rise for 1 hour. When dough has risen, preheat oven to 350 degrees F.
Turn dough out onto a lightly floured work surface and divide in half. Take on half of dough and divide into 3 equal pieces. Roll each into a 12-inch-long rope and place perpendicular to one another. At one end of the ropes, gather the ends of each piece together and press down to seal. Braid the three strands together. 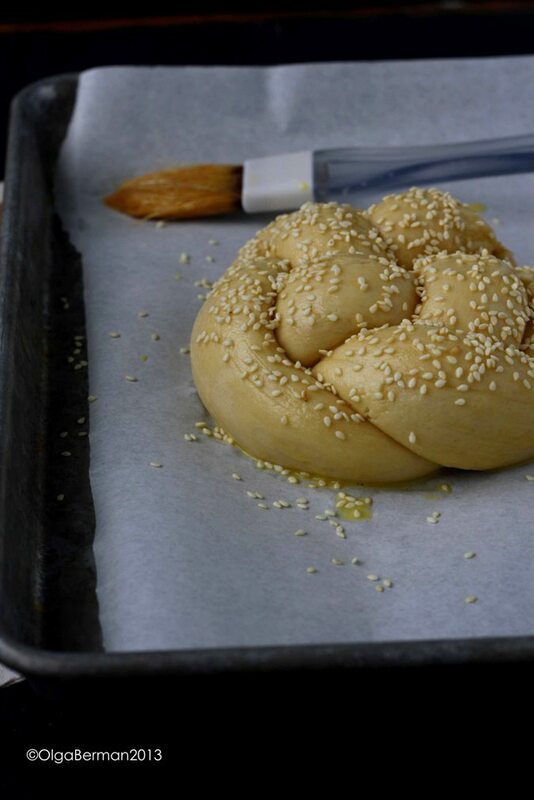 Grab each end of the dough braid and connect them to form a circle. Repeat with remaining half of dough. Place loaves on a greased or parchment-paper-lined baking sheet. Place egg yolk in a small bowl. Add a tablespoon of water and whisk to combine. Brush egg yolk , on the top and sides of the loaves to cover and sprinkle with sesame seeds. This recipe was incredible easy to make, made my condo smell divine and was really delicious. It's more dense than the Jewish challah I've made before, but just as satisfying. I had it with fig jam. Are you ready to win your own copy of Nile Style? 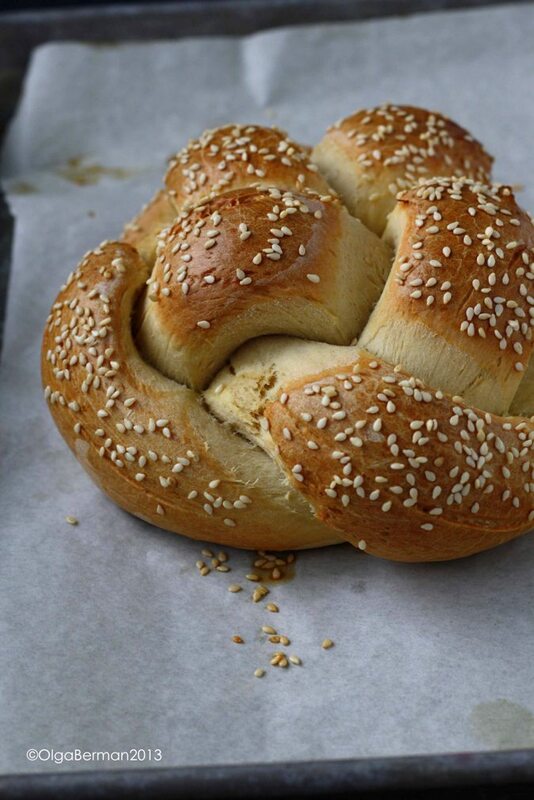 Leave me a comment with your favorite type of bread. I will choose one winner (randomly) Sunday July 21st. You must have a legal US address. And the winner is Mary!! 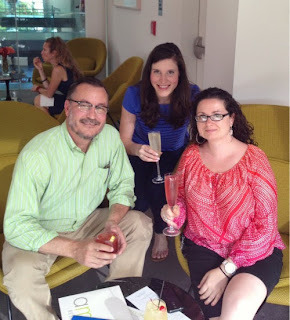 Last week I decided to visit my friends Jenn and Luis in Richmond, VA for 4th of July. I took Amtrak to Richmond after work on Wednesday and came back late Saturday night. It was a super fun and chill getaway filled with catching up, eating in, eating out, some art, meeting new people, and movies. 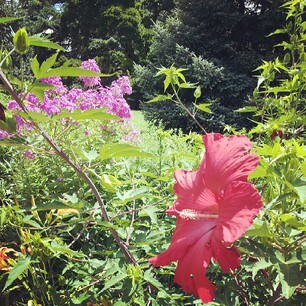 Below are some of the highlights through my instagram photos. Our first eating out experience was a visit to Dixie Donuts, recommended by Suzanne who works for the Virginia Museum of Fine Arts (more on how I met Suzanne later). 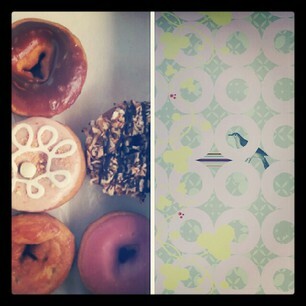 I loved the quirky wallpaper, the variety of the donuts and the friendly people working at the Dixie Donuts. The donuts were fresh, had fun flavors, and shockingly were only about $1.25 each! That's a steal compared to some of the places in DC! 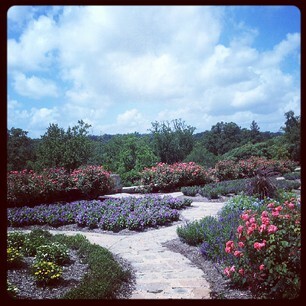 When I visited Jenn and Luis last year, we drove by the Maymont park, but this time around we actually visited this gorgeous space with beautiful trees, large grass lawns and fragrant flowers. I just wish it wasn't 90 degrees out that day. For lunch, Jenn and I checked out Blue Goat recommended by my friend K. I loved the art on the walls and the gorgeous bathrooms. Seriously, a restaurant with beautiful and clean bathrooms gets extra points in my book. 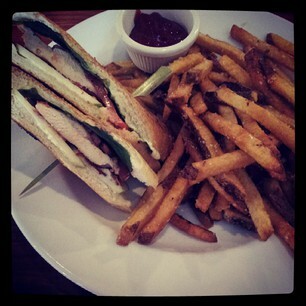 I ordered a panini with chicken, bacon, blue cheese and a Granny Smith apple. The apple was such a surprising and wonderful addition! 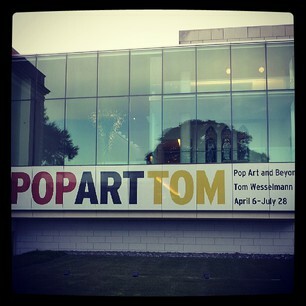 But we did not just eat: we also checked out a POP Art and Beyond exhibit at the Virginia Museum of Fine Arts. I was lucky because I was contacted by Suzanne who works for the museum and offered two tickets to the exhibit. She's also the one who suggested we check out Dixie Donuts. Just another great thing that comes from Twitter interactions! 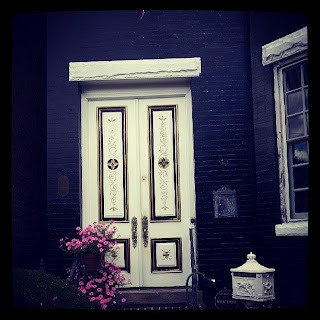 It was a great show: if you are in Richmond, make sure to visit it before July 28th. Before the exhibit, Jenn and I met up with Mary and Tim from 17apart! I love meeting bloggers I've built a relationship with on twitter and to find out they are just as fun,clever, funny and welcoming in real life as they are on social media! 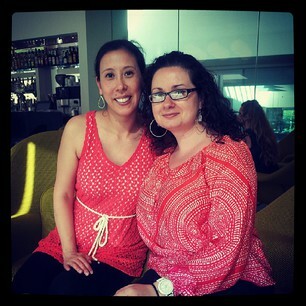 We met at the Amuse Restaurant in the museum for drinks and dessert. 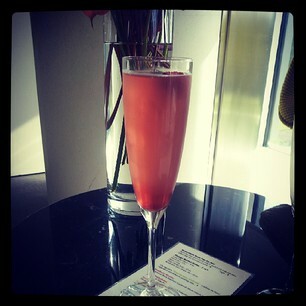 I ordered a Raspberry Dazzler made with Chambord Black Raspberry Liqueur & Myer Lemon Simple Syrup. 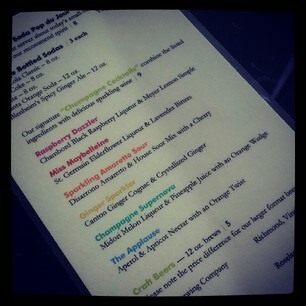 It's one of the many cocktails specifically created for the POP exhibit. 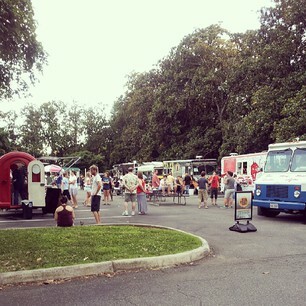 After drinks and the exhibit, Jenn and I decided to check out food trucks located by the museum thanks to the recommendation from Tim. It was so much fun! 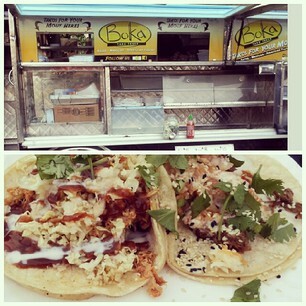 I chose a few tacos from the Boka truck: a definite must if you live in Richmond. The meats were moist and flavorful and I liked that you could customize your tacos with American, Asian or Mexican flavors. 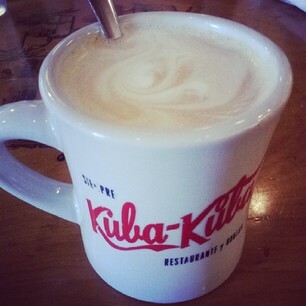 One of the highlights of the trip was brunch at Kuba Kuba. This place has been recommended by many people, and they were right! 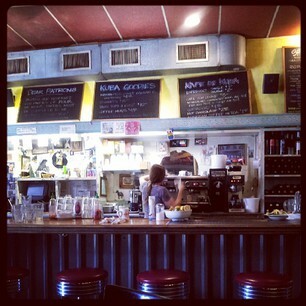 I loved everything from the Latin music, to the coffee con leche, super filling and fresh entrees and old school decor. I'm not sure whether it was because I asked about it, or because I bought one of their mugs, but the owner brought us their famous tres leches cake on the house! 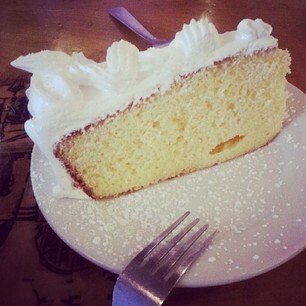 It's so famous and good that it's been featured on the Best Thing I Ever Ate show!! After brunch we had to walk off some of the food we consumed. Luckily, we were in the Fan area filled with picturesque houses. So I had to take a few photos. Ok, more than a few. And not only did we get a chance to look at the houses, but we got to visit Mary and Tim's house!!! It was so great to see some of the projects that they created that I saw on their website in real life. And of course no vacation is complete without a bit of shopping. 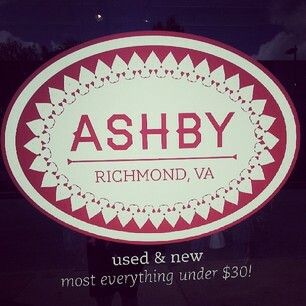 One of my favorite finds this time around was Ashby: great store with most all merchandise under $30!!! 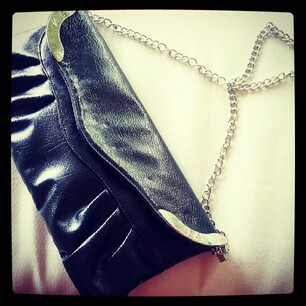 I bought a super cute bag for only $12. For something a bit more upscale, visit Modern Artifacts. 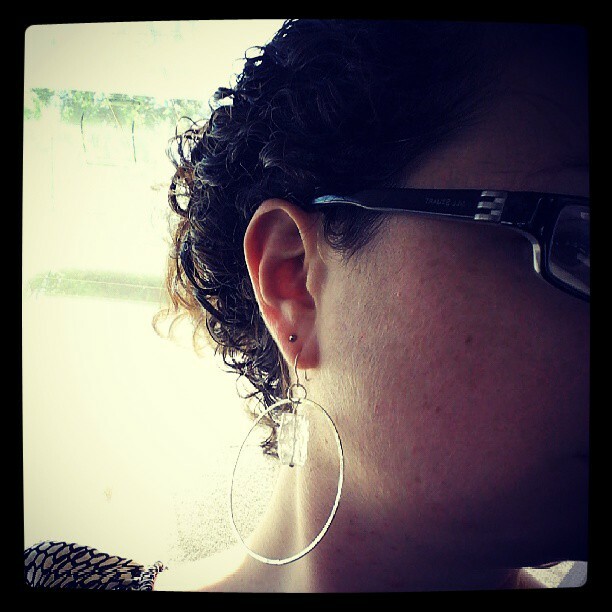 That's where I found my new super cool earrings. 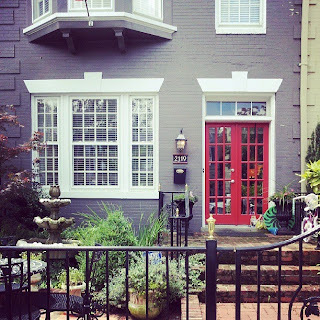 Have you been to Richmond? What were some of your favorite finds?